Last time I talked about building a constructed deck, the space was firmly occupied by one deck – Zombies. Recently, a new contender has entered the scene, a Darkforged Yetis deck. I even showcased this deck on a Forgemaster Constructed event yesterday. They are both good budget options, so I figured I’d talk a bit about each. Let’s start with the Yeti list. While I think it can be tweaked a smidgen with a couple more games under my belt, I’m content with this list. first we’ve got the two Spring Dryad Darkforged creatures – Dusk Hammer and Umbraskin Yeti. They are both hard to stop from pushing through damage, the tuskin with his breakthrough and the Yeti with his mobility. Darkstone Asir and Shroudthorn Splicer come in to help them grow and control the board. You then pump the creatures you’ve made with Weirwood Patriarch or Ferocious Roar, and then beat down. It’s a pretty simple deck, really, and surprisingly effective. You can go back and watch the videos I recorded of the deck if you want a little more information on it. Last time, I had decided on a preliminary deck to build towards. I’ve since modified that deck based on feedback from people, plus articles like Konan’s on the Solforge mothership, and from winning decklist results on the ladder. 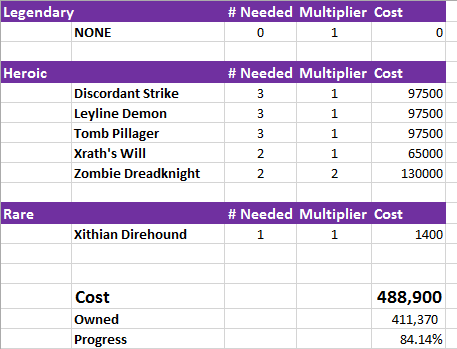 Comparing from last time, we gained Abyssal Brutes and Xithian Direhounds, lost a Scythe of Chiron, lost our Sorrow Maidens, and lost the Shadeclaw Zombies. 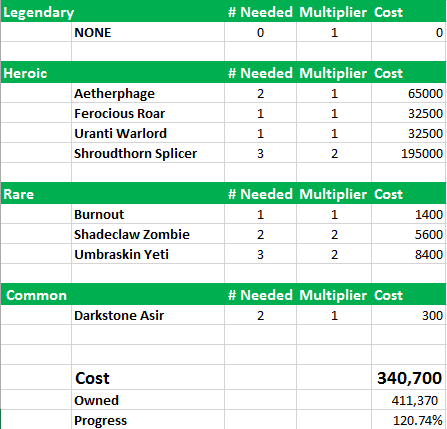 I wanted Abyssal Brute because it was a good source of regen to try to pump Zombie Dreadknight or Leyline Demon. The trigger with Zombie Dreadknight is random, which is unfortunate, but still a good source of pump and a very easy card to remove with Tomb Pillager if I manage not to level it on the first player rank. Leyline Demon is a card I really really want in my Nekrium decks right now – everyone and their brother is either playing Duskmaw or Relic Hunter, and having an extra creature in play is great, even if it’s only a 4/6. Xithian Direhound is a card I simply overlooked in the first iteration of the Zombie deck. It really needs to go in this deck in order to make Xrath’s will reach its maximum effectiveness, so I’m including it here. I took out Sorrow Maiden and Shadeclaw Zombies because they were too small and/or not aggressive enough. Sorrow Maiden does not have regen without Abyssal Brute and Shadeclaw zombie isn’t really worth pumping, so Zombie Titan came in to take its place. Lastly, I took out a Scythe of Chiron and put in a Nether Decay. 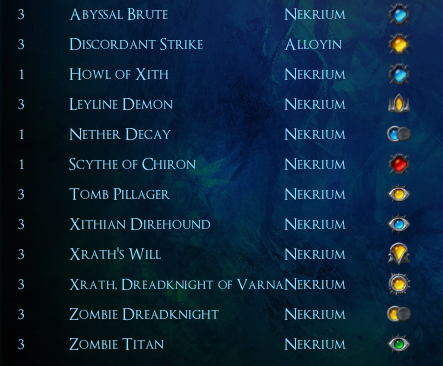 I would rather have Scythe in this slot, I think, but forging a legfendary is an expensive task. We can just play one for now and see how it performs. Nether Decay is a catch-all removal spell. I’m not sure how good it is, honestly. Other lists were playing it, so I will try it. I drew up a couple tables of the costs of finishing these two decks, along with how much silver I had currently and the % towards completion. 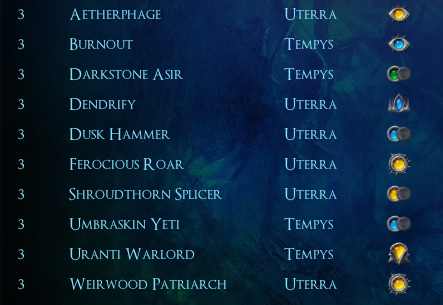 So if I wanted to, this Yeti list is ready to go if I wanted to forge it today. That’s very appealing, especially since I just played the deck and did fairly well with it. Can’t build this one quite yet – only 84% towards it. Still, that means in 70,000 Silver (about a week of normal play), I can build the deck. Another important thing to look at is how well these cards will adapt. 6.1 and 6.2 may bring Legendary darkforged, which would be a huge boon to any Darkforge-based deck. Of course, those cards would be legendary and expensive, but we could work towards them with the winnings of our Yeti deck. On the other hand, future sets will definitely bring more creatures with regeneration and more zombies. So zombies gets the edge here for promising to be more viable for longer. Therefore, I will go with Zombies (and the list above) to start marching into the Constructed queues with. Let me know if there is something I’ve overlooked in comparing the two decks!